Romance novels are typically not my thing. I make a few exceptions here and there, but I rarely actively seek them out. However, given the traumatic summer we’ve been witnessing across America, I needed a book that would allow me to check out of current events for a few hours and get my mind straight – kind of a palate cleanser if you will. I’m so glad that I gave the authors of Because My Heart Said So a chance to do just that. 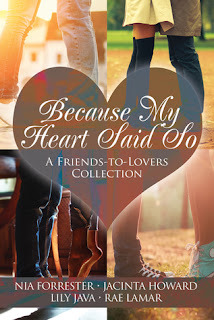 Made up of four novellas, Because My Heart Said So is full of smart, funny and engaging leading ladies. In Nia Forrester’s Acceptable Losses, junior attorney Lena is in love with her workaholic, dynamic mentor Quentin. Refusing to admit his marriage is over, Quentin keeps Lena at arm’s length, but when he sets her up with his brother and the two hit it off, he’s forced to admit that he may have made a mistake. Two of the novellas explore best friends turned lovers - Jacinta Howard’s Blind Expectations and Rae Lamar’s Blur. Both stories highlight all of the things that can go right (and wrong) when the thin line between friends and lovers is crossed. Blind Expectation’s Lena is forced to admit that when all other men have failed her, Trevor has always been a shoulder to lean on. And Blur’s Jade is forced to admit that her feelings for her childhood friend are different than they were when she was a teenager. While Kyle is teaching her to take life a little less seriously, she’s debating taking him more seriously. I connected least with Lily Java’s Blackbirds in which photographer Sydney had her heart broken by former coworker Elliott Vance. Elliott’s return to New York throws her for a loop and, before she realizes it, she’s falling for him again. It was a decent read, but it didn’t pull me in like the other stories. Overall, I enjoyed the ladies (and their men). The next time I need to escape from the world, I’ll definitely look to immerse myself in worlds and characters that they’ve created.